Congratulations, you’ve made the wise decision to purchase a home. Buying a home is a fun and exciting time. For most Canadians it’s the single biggest financial transaction of their lifetime. As such, it’s important to do your homework and come prepared. In this guide, we’ll help you do just that by walking you through the steps of buying a home in Canada. We’ll start with what to consider when buying or searching for a home. After that we’ll look at different property types, different markets and how to calculate if you can afford a home. Lastly, we’ll look at how to get the all-important mortgage financing in place so the transaction closes. Ready to begin your exciting real estate journey? Let’s get started! So, you’re ready to go out and start house hunting. Fantastic! Here are some things to consider to help narrow down your property search. Searching for a property can be overwhelming. That’s why it helps to come up with a list of home-buying wants and needs. Wants are things that you’d like in a property. For example, a Jacuzzi, tennis court, swimming pool, etc. Needs are must-haves, such as three bedrooms, a finished basement, garage, etc. When viewing properties, it helps to come prepared with a list of needs and wants. That way you’ll be able to objectively assess how well the home will meet your needs and wants for the next five years and beyond. An old cliché in real estate is that the three most important rules in buying a home are location, location, location. While that may be a bit of an exaggeration, your home’s location is one factor that you can’t change, so you’ll want to choose it wisely. You can renovate your home to your heart’s content, but if it’s beside a noisy freeway, that’s likely to affect its resale value, no matter how much money you pour into renovations, so you’ll want to choose your location wisely. Related to your home’s location is the decision of urban versus suburban. The biggest benefit of living in an urban area is the amenities. Usually there are lots of shops, restaurants and entertainment nearby. You may be able to save money by not owning a vehicle and walking to work. The drawback is that homes in the city tend to cost more. You could end up spending more for a smaller place. The biggest benefit of suburban living is that it often means more space and your home-buying dollar tends to go further. You may be able to afford a house with a yard in the suburbs when all you could afford is a condo in the city. If you don’t mind the longer commute, living in the suburbs can be a great for your lifestyle. The decision of the property type you’d like to live in mainly comes down to two factors: lifestyle and budget. Many Canadians would like to live in a detached house, but depending on your budget that might not be realistic in some less affordable real estate markets like Toronto and Vancouver. But don’t despair. Just because you can’t afford a house right now, doesn’t mean you can’t buy a condo or townhouse and move up the property ladder to a house later on. Let’s take a closer look at the three main properties types to consider. Condos provide a good entry point for most first-time homebuyers due to their affordability relative to most townhouses and houses. You also typically have less upkeep to worry about since your maintenance fees tend to cover mostly everything (although you may still be responsible for paying your hydro and/or repairs inside your condo unit). 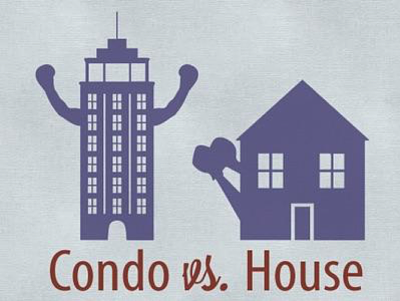 Condos tend to offer the least amount of privacy compared to the other property types. Being close to a noisy neighbour can ruin your experience. Although you won’t have to pay for costly repairs like a new roof directly, you’ll be indirectly paying for them through your maintenance fees, not to mention the occasional special assessment. Since new condos are always being built, condos tend to appreciate the slowest of the property types. A townhouse provides a good middle ground between a condo and house. Townhouses tend to be priced between the two as well. Depending on the townhouse, the grounds may be maintained similar to a condo, leaving you with fewer responsibilities (although you’ll have to pay maintenance fees to cover those). You also tend to feel safer since you’re in close proximity to your neighbours. Although townhouses offer more freedom than condos, they don’t typically offer as much freedom as a house. There may also be rules in place that restrict what you can do in terms of renovations and upgrades to the outside and inside of your place. The yards tend to be less spacious than houses, too. Of the property types, a house offers the most freedom. You can decorate it inside and out as you see fit. Most houses come with yards. This is perfect if you have children or pets. It offers them a safe place to play. House prices tend to appreciate faster than condos and townhouses in certain markets. Since houses tend to be more spacious, this means more space you can rent out to tenants to use to pay down your mortgage faster. Houses aren’t without their downsides. A house tends to be a lot more work. You’ll need to take care of the yard and surrounding property. That means mowing the lawn, shovelling the snow (or paying someone else to do it). Depending on the age and condition of the house, you’ll usually end up spending more on repairing and maintaining it compared to a condo or townhouse. With all these property types, you’ll need to choose whether you’d prefer to go with a new or resale property. This really comes down to personal preference. Figure out which one you prefer and narrow down your property search accordingly. When it comes to the real estate market, there are three main types of markets. Let’s take a closer look at them now. The first market type is a buyer’s market. A buyer’s market can best be described as many home sellers and few home buyers. This is often referred to as a “slow” market. Days on market (how many days a property takes to sell) tends to be higher. Home sellers may need to be more aggressive in their pricing. Since there’s less competition among buyers, buyers tend to be able to include more conditions to protect themselves, such as condition of home inspection, appraisal and financing. There also tends to be more room for negotiation in the selling price. Unless you’re a motivated seller (someone who needs to sell due to a life circumstance, such as job relation or divorce), you may choose not to sell your home at a discount during a buyer’s market and wait until the market picks up again. A seller’s market on the other hand is when there are few home sellers and many buyers. 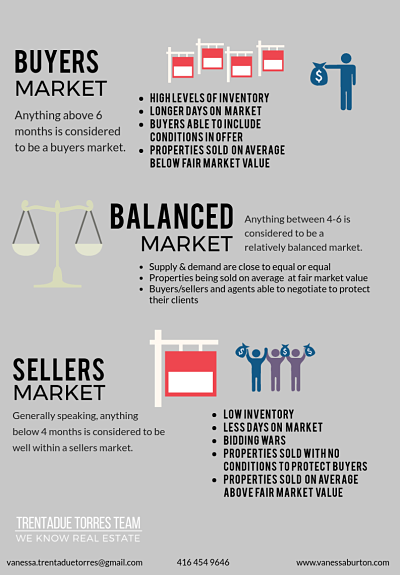 Sellers’ markets are often referred to as a “hot” real estate market. Days on market tend to be fewer and since there is more competition among buyers, homes tend to sell above asking price. Likewise, since sellers are in the driver’s seat, buyers aren’t typically able to include as many conditions to protect themselves. However, there are still ways to protect yourself, such as getting pre-approved for a mortgage and getting a home inspection ahead of time (often referred to as a pre-inspection). A balanced market is right in the “Goldilocks zone.” Not too hot, not too cold , but just right. In a balanced market, it’s a level playing field between home buyers and home sellers. There tends to be an equal number of home buyers and home sellers. No one has an advantage over the other. This is due to inventory levels. The number of active listings are sufficient based on the number of home buyers looking to purchase a home. In a hot real estate market, there might be 10 to 15 people making offers on a home, while a balanced market there might only be two or three. This provides you with a fair chance of purchasing the property. Lenders use several factors to determine whether you can afford a property. Let’s take a look at some of these important factors now. Lenders want to know you can afford to keep up with your mortgage payments. That’s why your income is considered. If you’re a salaried employee, most lenders look at the greater of your current salary and an average of your earnings for the last two years. All things equal, the more you earn, the more mortgage you’ll qualify for. A good rule of thumb to remember is that you’ll qualify for about four times your household income. So if your household earns $100K, generally you’ll qualify for $400K in mortgage. If you have a down payment of $100K, that means you can afford to purchase a $500K home. This is just an example though. If you’re serious about buying a home, I’d encourage you to get pre-approved by a mortgage broker to see how much you’ll actually qualify for before going house hunting. Besides your income, lenders also care about your down payment. Lenders want to see that you have some skin the game when buying a property. That’s why they require that you put money down in the form of a down payment. The government has set rules about how much you’re required to put down on a property based on its purchase price. If you’re buying a property under $500K, you’re required to put down at least five percent. If you’re buying a home with a purchase price between $500K and below $1 million, you’re required to put five percent down on the first $500K and 10 percent down on the portion of the purchase price between $500K and $1 million. Finally, if you’re buying a property with a purchase price over $1 million, you’re required to put at least 20 percent down. Keep these minimum amounts in mind when you’re saving towards the down payment on a home you’d like to purchase. You may not realize it, but your mortgage rate has a big impact on how much you can afford to spend on a home. The higher the mortgage rate, the less you’ll be able to afford to spend on a home and vice-versa. You’re also required to pass the mortgage stress test. When qualifying for a mortgage, you must be able to handle a mortgage payment based on the greater of the benchmark rate or your mortgage rate plus two percent, whichever is higher. When applying for a mortgage, most lenders want to know the value of your assets. Examples of assets include your vehicles, company pension plan and investments. Although your assets aren’t typically used to qualify you for a mortgage, most lenders want to make sure you’re financially responsible before approving your mortgage. Any debts you have are considered by lenders when approving your mortgage amount. Examples of debt include student loan, car payment, student loan and line of credit. The amount of debt will lessen the amount you can borrow byway of a mortgage and it could negatively impact your credit score. If you have a student loan that’s almost paid off and you’re in the market for a home, consider paying it off to increase the amount you can borrow as a mortgage. A mortgage represents a lot of money. Lenders want to make sure you’re a responsible borrower and likely to pay it back. That’s where your credit comes into play. You’re assigned a credit score by the credit reporting agencies in Canada (Equifax and TransUnion). Credit scores typically fall between 300 and 900. To obtain the best mortgage rates, aim for a credit score of at least 680. To build and maintain a good credit score, always pay your bills in full and on time. Getting approved for a mortgage involves two stages: getting pre-approved and approved. Once you’re serious about looking for a property, before you go out and start looking at properties, I’d encourage you to get pre-approved for a mortgage. A mortgage pre-approval tells you how much you can afford to spend on a property. Without a pre-approval, you could spend your time looking at properties outside your price range. 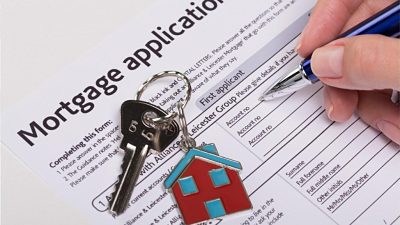 To get pre-approved for a mortgage, you’ll need to complete a mortgage application form. You’ll also need to provide documentation and ID, such as notices of assessment for the last two years, an employment letter and copy of government issued photo ID, such as your driver’s license. The lender will also want to pull a copy of your credit report. Based on that the lender will tell you how much you’re pre-approved to spend on a property. You’ll often obtain a rate hold as well. As the name suggests, a rate hold guarantees you a mortgage rate for a certain period of time, such as 90 to 120 days. Once you’ve made a successful offer on a property, it’s time for the final stage, the mortgage approval. Your lender will want to check your finances one last time to make sure nothing major has changed (i.e. you’re still employed and you still have your down payment funds). The lender will have a number of conditions that must be satisfied before your mortgage will be approved, such as ordering an appraisal. Once you sign the mortgage commitment package and the lender conditions are satisfied, your mortgage will be approved. Hooray! That wasn’t too bad, was it? Congratulations! You’ve made it to the end of our home buying guides. 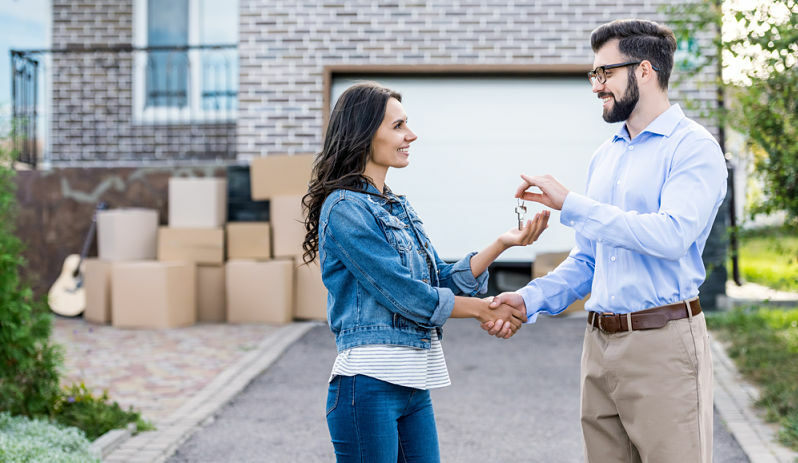 These are some of the major steps involved in buying a home to give you the confidence to make an offer when you find a property you like. Good luck and happy home hunting! Sean Cooper is the bestselling author of the book, "Burn Your Mortgage: The Simple, Powerful Path to Financial Freedom for Canadians". He bought his first house when he was only 27 in Toronto and paid off his mortgage in just 3 years by age 30. Sean is a personal finance journalist, money coach and speaker, his articles and blogs have been featured in publications such as the Toronto Star, Globe and Mail, Financial Post and MoneySense.